In 1988, Medellín was branded the ‘world’s most dangerous city’ (Time 1988). Merely twenty-five years later it was heralded the leading urban centre for innovation (Urban Land Institute 2013). From a reputation of mass homicides and rampant drug trafficking to one of dynamic modernisation, Medellín’s transformation is remarkable. Whilst reminders of the devastation are visible, having visited the city over the summer it seemed somewhat detached from its horrific past. One must question how this profound metamorphosis has been achieved. One of the most discernible images of innovation I witnessed arose from mobility. Whilst exploring some of the most deprived Comunas, I was struck by the juxtaposition between the “informal”, and in some places decrepit housing, and the modern transportation infrastructure. It led me to explore the role increasing mobilities has played in the cities transformation. 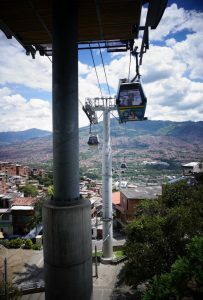 As part of the city’s Integrated Urban Projects, three aerial cable-car public transport systems and a series of escalators were developed to connect the underdeveloped “informal” communities to the “formal” population along the main Metro line (Brand and Dávila 2011). Whilst the principle behind transport infrastructure providing a solution to social exclusion is clear, one must question the extent to which these schemes have truly resulted in the desired economic and social outcomes. Are developments, such as the Metro Cable pioneering and effective solutions to urban inequalities? Or are they merely highly visible interventions that only superficially convey images of modernity and inclusion (Reimerink 2018)? Ample literature exists to support the view that such developments have not increased the mobility of the urban poor and thus have not produced the desired social and economic outcomes. To quantify the precise outcomes of these transportation schemes is problematic due to a lack of available data and the infrastructure’s conjunction with other improvement projects (Brand and Dávila 2011). However, it has been suggested that in the barrios where the stations are situated, under 10% of daily trips are via the cable car systems (Brand and Dávila 2011). This failure may be attributed to the importance of context; whilst mobility is a prerequisite of contemporary society, the operation and insertion of transport routes must coincide with the local users’ temporal patterns and economic situations (Kauffman et al., 2004). Thus, it has been argued that there is a “vision dissonance” between the mobility issues as perceived by the planners and the public (Kash and Hidalgo 2014). For example, the Metro Cable has arguably failed to meet the needs of the local residents due to issues surrounding luggage restrictions, safety for women and walking distance to the nearest station. Many of these problems have meant that residents opt to continue to use pre-existing transportation schemes such as the bus, despite the potential economic and temporal benefits of the Metro Cable (Brand and Dávila 2011). The dislocation between the vision of the planners and the needs of the population is clear. The Metro Cable and Escalators located in Comuna 13 are undoubtedly of enormous symbolic and political significance. Arguably, the Mayors’ motivation to produce visible and media-friendly solutions to entice international recognition and praise has led to the implementation of superficially modern and effective schemes (Reimerink 2018). These publicity-centred gains may have seen Medellín receive international accolades but are arguably not providing appropriate long-term solutions to social exclusion, nor changing the lives of the local people. As our Comuna 13 walking tour guide noted, whilst the escalators may produce a bold and visible image of innovation and opportunity, there was much resistance to their development as many of the local citizens did not see their relevance; the old stairs did not produce their most significant barriers to mobility. One must therefore question whether planners have neglected the real mobility problems in order to fulfil superficial goals of internationally recognised modernity. Whilst in many ways these transport schemes have not been efficacious, this is not to say they are without merit. Both local residents with whom I conversed and research surrounding the matter concur on an important result of these products of ‘social urbanism’. They have produced a “feeling of inclusion and integration into the ‘modern’ city” (Brand and Dávila 2011:647). 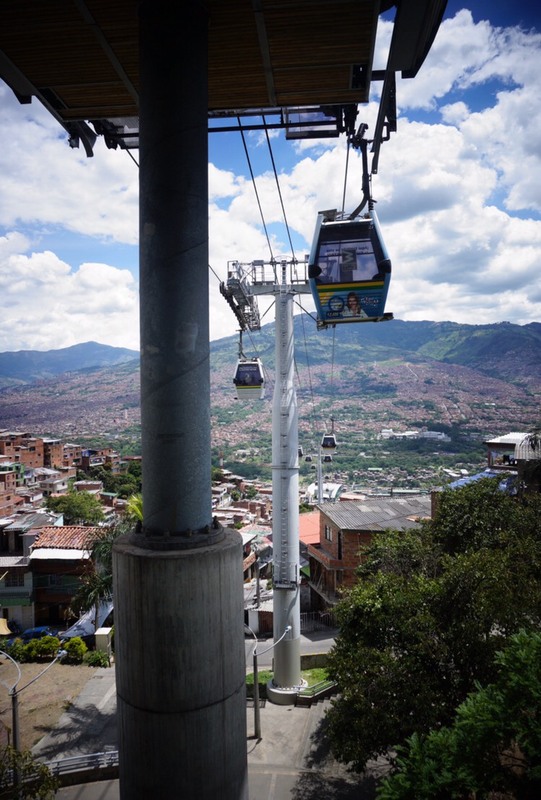 Whilst the Metro Cable and Escalators may not have achieved their desired usage and thus economic and social effects, they have begun to redress the view of these neighbourhoods in the eyes of the Comunas residents, Medellín inhabitants and internationally. By beginning to restore the image of the once war-torn city, it has encouraged tourists, such as myself, to venture into the previously inaccessible areas. As I was repeatedly reminded, for the local residents in the most deprived Comunas, tourists signify hope, pride and their continuing integration into the innovative and modern city. This in itself may begin to redress the contrast between prosperity and poverty, opportunity and shortcomings, and mobility and immobility in Medellin. Adey, P. (2010) Mobility, Abingdon: Routledge. Ohnmacht, T., Maksim, H. and Bergman, M.M. (Eds.) (2009) Mobilities and Inequality. Farnham: Ashgate. Following a project of ‘social urbanism’, Mayors Sergio Fajardo (2004-2007) and Alonson Salazar (2008-2011) have injected vast financial investments into the poorer, or “informal” communities, that line the hillsides of the Aburrá Valley (Reimerink 2018). One of the most recognised outcomes of these investments are the Metro Cable and the Escalators of Comuna 13. The primary aim is to diminish the socio-spatial exclusion between prosperity and poverty. Such strategies fall in line with increasing literature in the social sciences proclaiming a ‘mobilities turn’ (Schwanen 2017). As it is increasingly acknowledged that mobilities must be treated as ubiquitous, the inherent hierarchy to mobility must also be recognised (Adey 2010; Cresswell 2010; Ohnmacht et al., 2009). Mobility is socially and spatially uneven and is producing and produced by social relations and power (Cresswell 2010). Those people and places in the fast lanes have a clear advantage (Sheller and Urry 2006). Therefore, one could argue that by expanding the mobilities of the urban poor in Medellín, one increases their motility; that is their ability to relocate both socially and geographically and thus diminish social and economic exclusion (Ohnmacht et al., 2009).